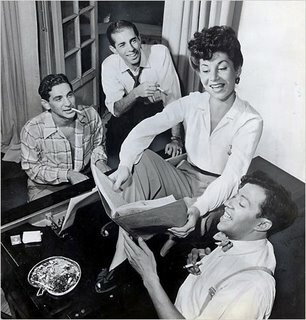 "Betty Comden, who with her longtime collaborator Adolph Green wrote the lyrics and often the librettos for some of the most celebrated musicals of stage and screen, died yesterday in Manhattan. She was 89 and lived in Manhattan. The cause was heart failure, said Ronald Konecky, her lawyer and the executor of her estate. 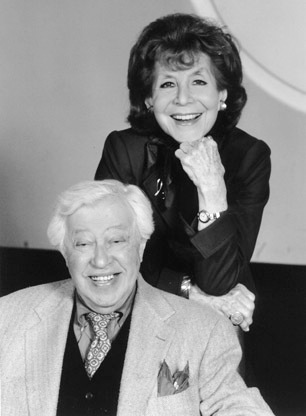 During a professional partnership that lasted for more than 60 years, and which finally ended with Mr. Green’s death in 2002, the Comden-Green blend of sophisticated wit and musical know-how lit up stage shows like 'On the Town,' 'Wonderful Town,' 'Peter Pan” and “Bells Are Ringing.' Their Hollywood credits included the screenplays for two landmark film musicals, 'Singin’ in the Rain' and 'The Band Wagon.' "
Composer Leonard Bernstein, choreographer Jerome Robbins, Betty Comden and Adolph Green rehearsing "On The Town," for Broadway, 1944. Another of my favorite Comden/Green numbers is a Jule Styne collaboration, from the 1956 show "Bells Are Ringing" (and the 1960 film of the same name), "Just In Time." It's a great, swingable number. I couldn't find a sound file of that number to post, but there are a lot of excellent recorded versions out there (I'm partial to Dean Martin's and Bobby Darin's), but here's a song from the same show. Comden lacked the colloquial charm and perfect genius of Dorothy Fields, but she was a solid writer and another great rarity in that field, a female lyricist. So let me end with a quote from George Abbott, the veteran Broadway director who helped make On The Town a hit for its neophyte composer, lyricists, choreographer and producers. They’d sent him the script as the longest of long-shots. He read it on the train. “I like the smell of this,” he said. “Let’s do it tomorrow.” And he got off the train. Half a century later, I put to Mister Abbott the points I made above – ordinary situation, ostensibly regular boy-meets-girl love song but dramatically enlarged by the great geopolitical conflict in which they were caught up, their romance now freighted with uncertainty, etc. Mister Abbott, at the age of 106, brushed this aside. Which is always good advice.